Ischemic tolerance in the brain (M. Bell et al.). 2. Regulation of gene expression by hypoxia in lung alveolar epithelial cells (C. Clerici et al.). 3. A profile of the metabolic responses to anoxia in marine invertebrates (K. Larade, K.B. Storey). 4. The role of adenosine in tissue protection during ischemia-reperfusion (G.W. Sullivan, J.M. Linden). 5. NF-&kgr;B Function in Inflammation, Cellular Stress and Disease (N.R. Chapman et al.). 6. MAPping stress survival in yeasts: from the cell surface to the nucleus (A. Ngocky Nguyen, K. Shiozaki). 7. Calcium signaling mediated by cyclic ADP-ribose and NAADP (Hon Cheung Lee). 8. The cellular and molecular basis of the detection of pain (J.K. Bonnington et al.). 9. Acquired freezing tolerance in higher plants: the sensing and molecular responses to low nonfreezing temperatures (Zhanguo Xin). 10. Sensing and responses to low temperature in cyanobacteria (D.A. Los, N. Murata). 11. Dehydrins (J. Svensson et al.). 12. Dual role of membranes in heat stress: as thermosensors they modulate the expression of stress genes and, by interacting with stress proteins, re-organize their own lipid order and functionality (L. Vígh, B. Maresca). 13. Cellular adaptation to amino acid availability: mechanisms involved in the regulation of gene expression and protein metabolism (S. Mordier et al.). 14. Amino acid-dependent signal transduction (P.F. Dubbelhuis, A.J. Meijer). 15. Signal transduction pathways involved in the regulation of drug metabolizing enzymes (V. Hebbar, A.-N. Tony Kong). 16. Biological action of infrared radiation (L. Laurent-Applegate, S. Roques). 17. Energy sensing and photostasis in photoautotrophs (N.P.A. Huner et al.). 18. The uncoupling proteins family: from thermogenesis to the regulation of ROS (M.-C. Alves-Guerra et al.). 19. Regulation of proliferation, differentiation and apoptosis of brown adipocytes: Signal transduction pathways involved (A. Porras, M. Benito). 20. Control analysis of metabolic depression. (R. Keira Curtis, T. Bishop, M. Brand). 21. Evolution of physiological adaptation (D.L. Crawford). 22. Dynamic use of cDNA arrays: heterologous probing for gene discovery and exploration of animal adaptations in stressful environments (S.F. Eddy, K.B. Storey). 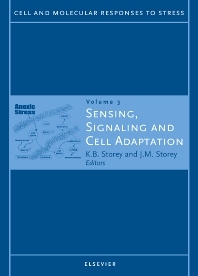 In this volume of Cell and Molecular Responses to Stress articles provide up-to-date information on key areas of signal sensing (sensing of pain, heat, cold, light, infrared radiation), molecules involved in the intracellular transmission of these signals, metabolic responses to stress including changes in gene expression and production of specialized proteins that aid cell responses to factors including interrupted blood supply (ischemia), oxygen limitation (hypoxia/anoxia), freezing and dehydration, amino acid limitation, radiation and processing drugs. There are chapters which also provide insights into new technologies (such as cDNA arrays), analysis of metabolic control theory (a key method for analysing stress effects on cells), and examine how enzymes evolve in the face of stress.